In bond court on The Good Wife, (Sundays, 9 pm, CBS) there’s always a baby crying somewhere in the background. It’s not blaring. It’s not something the show focuses on directly. You never see the baby. But it’s crucial to the setting. In its seventh season, The Good Wife is a show idealistic about ideals but cynical about process. Usually, the lawyers do the right thing, but not through Grinder-style inspirational speeches about the nature of justice before the court. Instead, our heroes have to exploit loopholes, adjust strategies to judges’ personality quirks, and deeply investigate cases to turn them their way. But that can’t happen in bond court. This season brings titular good wife Alicia Florrick down to earth. The last-minute election scandal plotline that took her power away was a particularly absurd capper to a flawed season. Yet, it’s almost worth it for the scenes in bond court, where Alicia has to argue bail for clients not quite poor enough to have a public defender appointed for them. Here, The Good Wife leans pretty heavily on the cynical end of the equation. Alicia’s pressured to blitz through as many cases as possible. Last night’s episode made the subtext text. And so how does The Good Wife communicate that chaos? Through the sound of babies crying. As anyone who’s ever been a passenger on a plane knows, there’s nothing more stressful than a crying baby. Maybe it’s an evolutionary instinct, but the sound of a child crying irritates and distracts on a primal level. The sound also implies that the people at bond court are low-income. They don’t have babysitters or another parent to take care of their child. Layered on top of the crying is the ambient din of murmured conversations and the ringing of phones. This is a shared space, it says. This is utilitarian, it says. This is not, in any sense, justice. And it’s not like Alicia Florrick can change that through starry-eyed idealism either. All her efforts do is gum up the works, slow down the cases, and make the judge angry. To provide a stark contrast, the show switches to scenes of high-powered lawyers arguing about medical malpractice in an assisted suicide. They languish over the details. They call multiple witnesses. They break for recesses. They negotiate over millions of dollars. During these scenes, the ambient noise is blessedly quiet. No ringing phones. No undercurrent conversation. And thankfully, no crying babies. 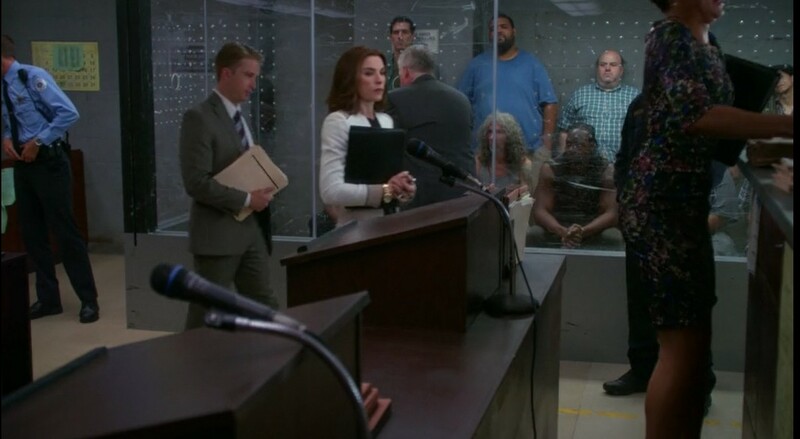 On The Good Wife, justice doesn't just look different for the rich and the poor. It sounds different, too.